How a bad wheel alignment can hurt your vehicle and your wallet! Poor wheel alignment can reduce the life of your tires by thousands of miles as well as potentially compromise your steering and suspension parts. When driving on misalignment wheels you also reduce your fuel economy greatly. These threats can all add up to a lot of money out of your pocket. 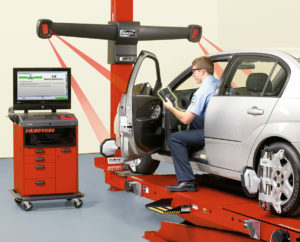 At RAD Auto Repair we offer a free alignment check so our customers are always aware of the alignment of their wheels. Here is a list of the most common signs that your wheel alignment is off. This many times can be due to under-inflated tires. It is recommended to check your tire pressure. If tire pressure is good and you are still noticing a pull your wheels it is probably out of alignment. There are certain indications that the alignment is off from the way your tires are wearing. For instance wear on only the inside or outside can indicate problems with your camber adjustment. Scalloping or feathering patterns often indicate problems with the toe adjustment. Tire pressure can also play a crucial role in how your tires are wearing so it is always advised to check your tire pressure regularly. It is important to take notice of the position of your steering wheel. In many cases of an alignment issue the steering wheel will not be able to stay in the center position to move the vehicle straight. If the steering wheel is not level this is a potential alignment issue. *It is important to note that many times people will note feeling a vibration in the steering wheel. This most often times is due to an imbalance in the tires. The imbalance can be caused from poor alignment. The above symptoms are just a few of the most common signs that your vehicle is out of alignment. There are many causes that can create this issue. Most likely it is due to broken or failing suspension parts that may need to be replaced in order to get your vehicle aligned. The best way to prevent these problems is to get regular alignment checks. The technician will be able to inspect the alignment as well as the suspension parts such as the control arms and tie rods that help the wheels stay aligned. Please feel free to call RAD Auto Repair at 480-633-5505 and schedule your free alignment check today.